Jose Rolon Rivera, 7, receives medication for his asthma at the San Jorge Children's Hospital in Puerto Rico. The hospital only has enough fuel to power its emergency generators until Saturday, an administrator says. 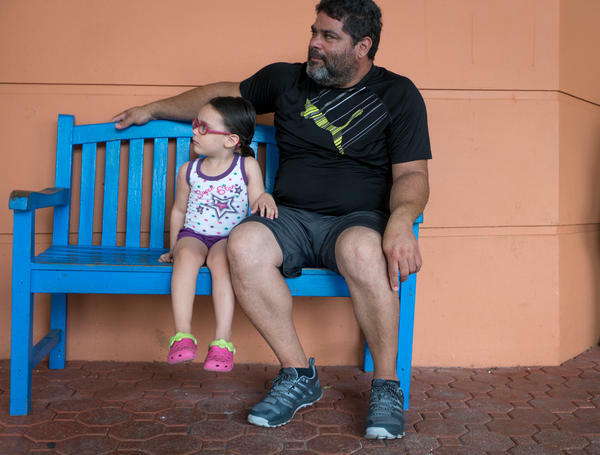 Angelica Alicea, 3, and her grandfather Julio Alicea wait outside the San Jorge Children's Hospital. "If we don't get help, something is going to happen that will be a long-term problem for Puerto Rico," says San Jorge Vice President Domingo Cruz Vivaldi. "Right now we are dealing with a crisis." 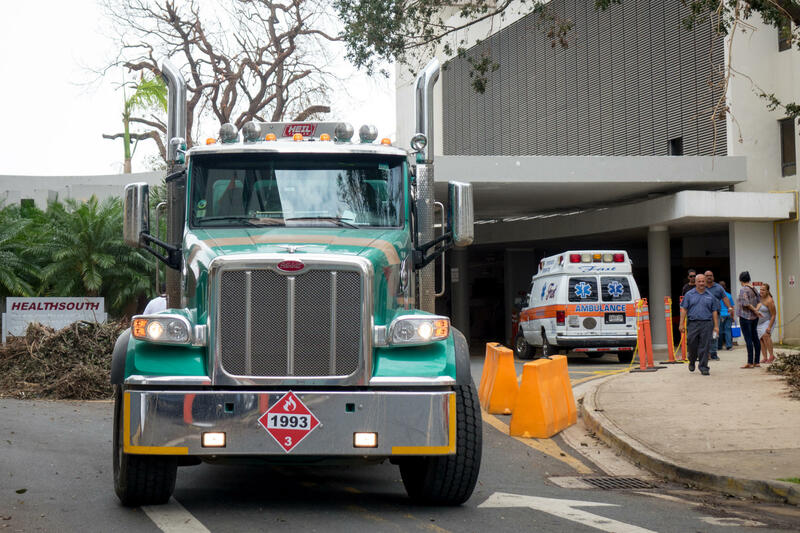 A truck hauling diesel leaves the University of Puerto Rico's Medical Center, which is operating on diesel-powered generators following Hurricane Maria. Gynecological oncologist Dr. Pedro Escobar says his hospital had hundreds of patients scheduled to get chemotherapy or surgery in the coming weeks. If they don't, patients will be inoperable "and the outcomes are not going to be good," he says. The federal government has set up seven mobile clinics to help with trauma care. A week after Maria, many hospitals are still shut down and the few that are open are operating with just emergency generator power. 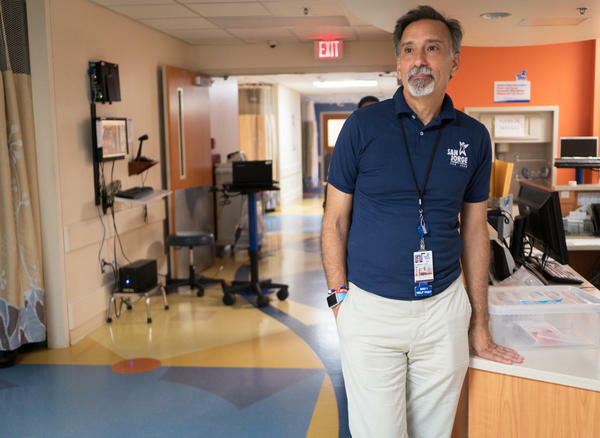 With a scarcity of fuel, dwindling supplies and disruptions to their employees' lives, hospitals say they are in crisis, laboring to provide care at a time when it's needed most. Maria didn't force San Jorge to close its doors, though the hospital is seeing an increasing number of patients with problems related to Hurricane Maria. 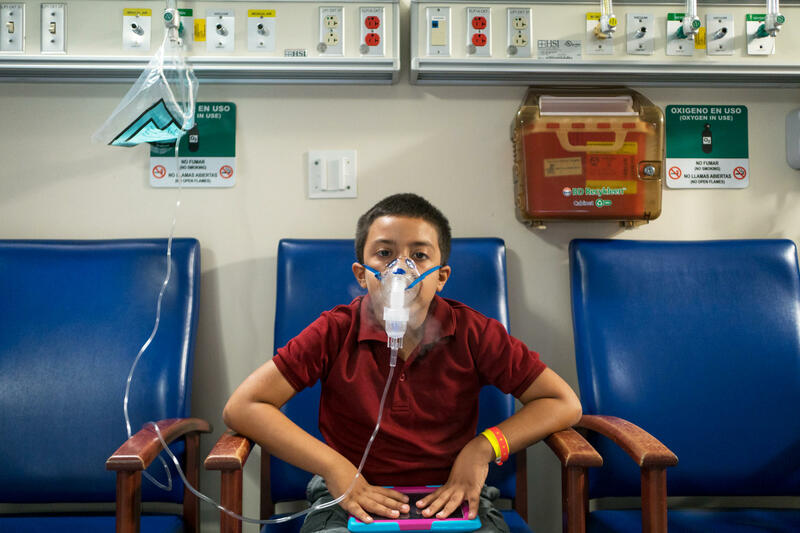 "We have seen some broken bones and cuts," says hospital vice president Domingo Cruz Vivaldi, "and then because of the conditions, we have unstable asthma patients, diabetes patients." Residents aren't getting preventive medicine at this time, he says. In Puerto Rico, doctors' offices and walk-in clinics haven't reopened since the storm. Hospitals and some newly opened mobile clinics are the only places delivering health care. "It's been a struggle to stay open," says Cruz, because "diesel doesn't come easy to the hospital." Earlier this week, the hospital ran out of diesel, he says, and was without power between 6 p.m. and 2 a.m. With no power, Cruz says the hospital was forced to discharge 40 patients. On Wednesday, the Army Reserve delivered 4,000 gallons of diesel — enough to power emergency generators until Saturday. Cruz says although emergency generators are keeping the hospital running, they are just a backup — and are likely to fail eventually if the hospital isn't reconnected to the power grid soon. The government in Puerto Rico says one of its top priorities is restoring power to the island's hospitals. A loud hum fills the air at the medical center at the University of Puerto Rico, a cluster of about 10 patient and research hospitals. It serves not only Puerto Rico, but the entire Caribbean. After hurricanes Irma and now Maria, the campus has been pushed to the limits. Maria knocked power off the island's largest public hospital and though it was quickly put back on the grid, it didn't last. "Power was on just a few hours before going down again," spokesman Jesus Velez says. Since then, the hospital is back on emergency generators. Velez is confident that the emergency plan set up for the hurricanes "is working well." Back at San Jorge Children and Women's Hospital, some employees have been living at the hospital since Hurricane Maria because their homes were destroyed and because of gasoline shortages. The hospital is providing meals to staff. Cruz says that security has also been an issue — gas has been siphoned and stolen from employees' vehicles and stores in the neighborhood have been robbed. 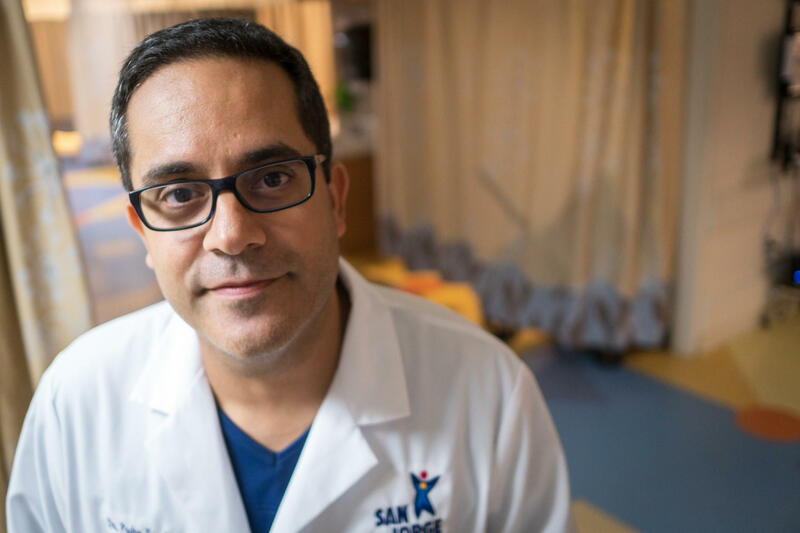 Since the storm, Dr. Pedro Escobar says the staff at San Jorge has been mostly able to provide just emergency care. But he's a gynecological oncologist and concerned about his patients, many of whom have had important treatments and surgeries postponed. "We have hundreds of patients that are either scheduled or they're getting chemo and after that they need to be operated on in four or five weeks," says Escobar. "Otherwise she's going to be [inoperable] and the outcomes are not going to be good." Asked how he rates the current emergency situation at the hospital, from one to 10, after Hurricane Maria, he says 12, without hesitation. Even before Maria, Puerto Rico's health care system was in trouble. Doctors and health care providers here have long asked Congress to boost Medicare and Medicaid payments to match those in the mainland. But with no power, little running water and a health care system stretched increasingly thin, Cruz says Puerto Rico now faces a humanitarian crisis. "If we don't get help, something is going to happen that will be a long-term problem for Puerto Rico. Right now we are dealing with a crisis, so we need Congress and we need the president to step up." 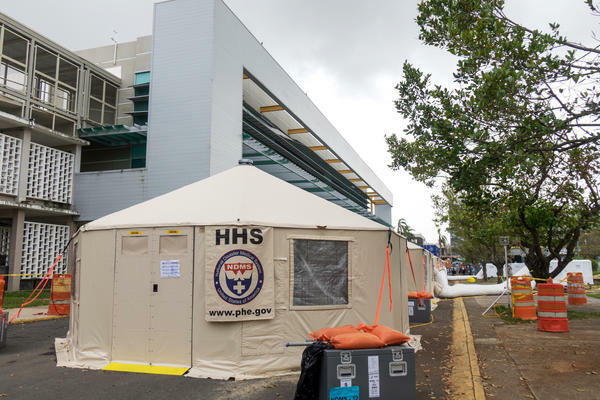 Working with Puerto Rican officials, the federal government has now set up seven mobile clinics to help with trauma care. And the Trump administration says it's dispatching a Navy hospital ship, the USNS Comfort, to the island, due to arrive next week.